Obviously this is going to be one of the pages that will be constantly updated. Let's start with some acoustics. So let’s kick off with Acoustic guitars. I love playing acoustic as it’s much more physical but in a subtle way. This is my main acoustic - a 68 Gibson Hummingbird (with an incredible amount of checking). I got it in 68 from an American serviceman who had bought it, taken it to Vietnam and never played a note on it. It’s been refretted 6 or 7 times and the only defect it has is the very narrow neck. This guitar sounds great on tape and in the studio. Live she’s a little quiet but still with that rich sound texture. 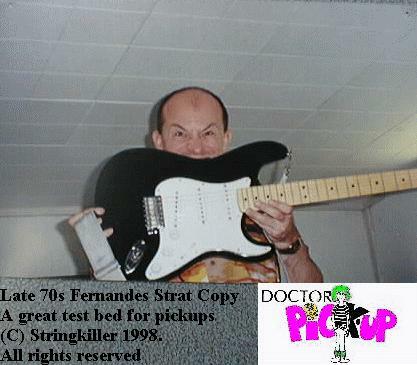 I have just moved to DR Zebra Strings (12-52?) and they add about 50 % volume to this guitar. The tone is very very sweet. The Dove was on loan from my friend Momoc. The Fender Deluxe belongs to my friend Didier and sounds sweet. Here’s a back shot of the two guitars. Most Hummingbirds from the 70s on have split backs. I love quality control. Everyone benefits. 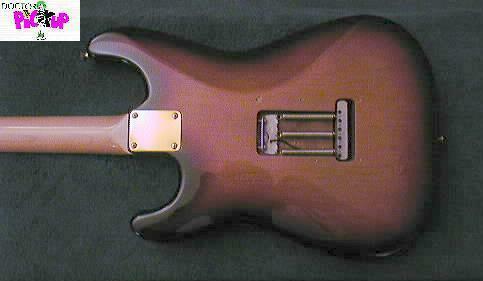 This is an area where certain US manufacturers still need to work on, the black Ibanez Prototype I got for half price. (The factory had forgotten to put the strap pin into the hole on the body.) This guitar has a great sound and is loud and great for Slide and Nashville tunings. 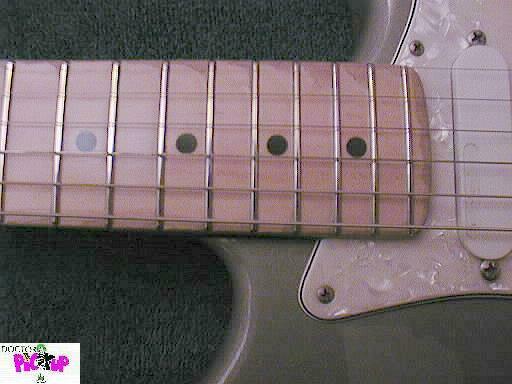 Click here for a Summer 2000 update on the Black Ibanez - I'm in the process of experimenting with different strings! The 12 String is an Ibanez which I bought in the 70s for 500 French Francs ($ 90) when we used to live in Compiegne (a good place to live if you have to work in Paris and Brussels). The road from Muthaiga to Paris is a long one and like many professional guitarists I have had my share of Fender Stratocasters. I very rarely use them as my main axe with Dr Pickup but when I’m playing in Aventure or backing up a singer or for certain studio gigs I like to take along an SRV Stratocaster or a Clapton Stratocaster. Dinky, my wife gave me a SRV Strat for my Fortieth birthday and the other I got in Savannah, Georgia and have since sold. (What a way to pay for your kids college education!). 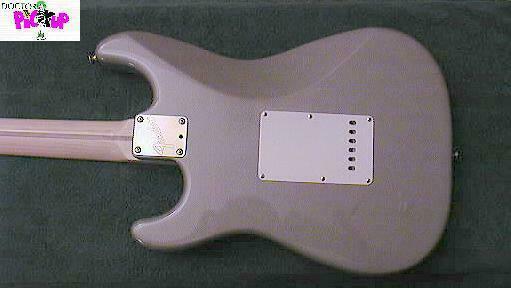 You’ll see I have changed the pickguard on the one I kept. 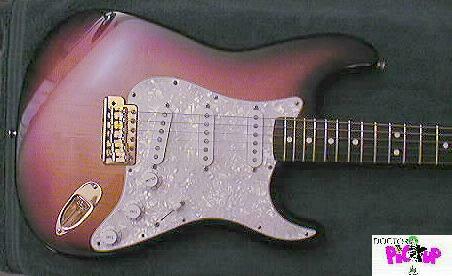 Here are some newer shots (December 1999) of my 1992 Fender SRV Stratocaster. 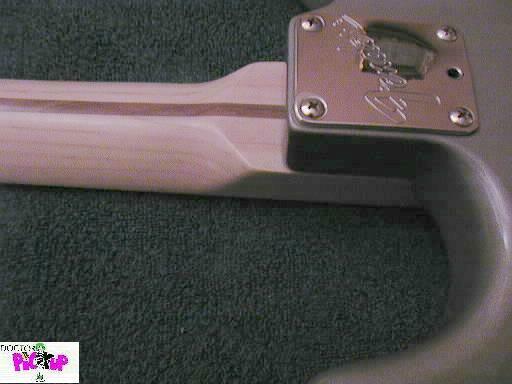 SRV stands for Stevie Ray Vaughan, here's his signature on the headstock of the guitar. and I think one of the reasons why this guitar has such a good sound. The Texas Special pickups also sound great. 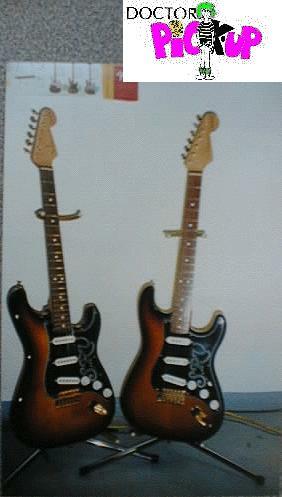 who played these right handed guitars left handed so they were upside down. Here's the back - I normally put all 5 springs in my Stratocasters but this one just feels better with the three. Five seem to make it feel a little stiffer. Most of my friends say this guitar is really hard to play I just find it to be a great tone machine. Notice the poor workmanship in the drilling of the 6 holes for the vibrato cover which had to be done twice. 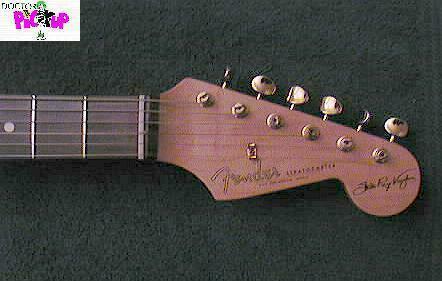 This is a great Stratocaster copy , the brandname is Fernandes but I believe the early ones were made by Fugi-Gakki who also made the first Fender Squiers. 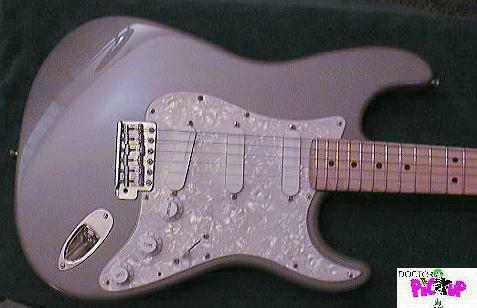 I used this as a testbed guitar with Robert Pionnier to check out all those Seymour Duncan type Stratocaster replacement pickups. As always I regret having parted with this axe but I know it’s in good hands. The picture comes from the The Alizé concert, January 1999. And here you can hear it. It is a through a super amp - The Mesa Boogie Subway blues. Alize Restaurant on 15 January 1999. To finish off for now here is a street shot of my PRS Standard which Dinky, my wife got for me in Tampa in 1989. This guitar can do everything Stringkiller can ask of it. Although I badmouthed PRS during my visit to the Paris Music show 1998 they know it is only to keep them keeping on with those very high standards. 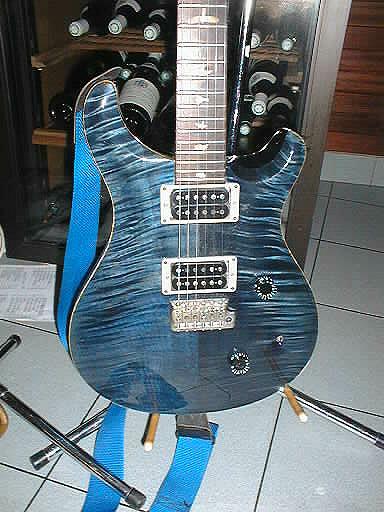 This guitar is now in the PRS Forum Image gallery with a whole load of very stunning PRS guitars. Here's the link if you want to hear the complete songs. Thank you to the composer Luis Talon for permission to use his copyrighted songs. 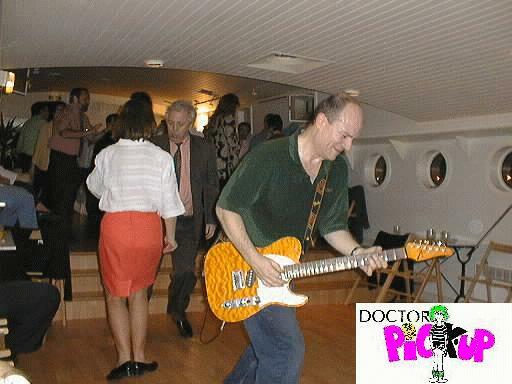 Here’s another shot from a concert on the Charleston peniche (riverboat) in Paris for a private party on the 2 April 1998. Paul Reed Smith guitars lovely to play and the pickups just rip or purr. The locking tuning pegs, which need only a quarter of turn, are a godsend if you break a lot of strings like Stringkiller. Here’s my number 2 guitar, a 1994 Tom Anderson hollow body Telecaster type job. 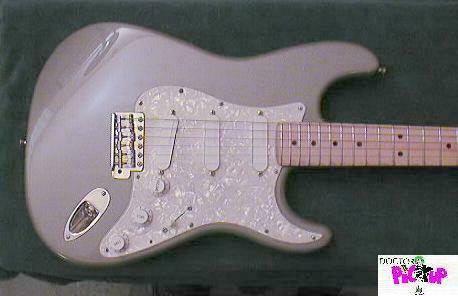 First it plays and intonates beautifully, the pickups are great and it weighs about 4 pounds. This can really make a difference on a 5 to 6 hour gig in the week. The above link is to my Telecaster shootout. This is a rather neat and versatile guitar. If you look at the lower side of the neck you can see the peeling process has started. Here's a close up of the neck. Hey what about bass guitars? Dec 2001 reposted as the previous xoom went out of business. Stringkiller has just finished a Telecaster shoot out. and hearing these 5 Telecasters in action?